As founder and president of the first beer company to operate in Delaware in four decades, Blue Hen Beer Company’s Jeff Johnson faced significant challenges. He realized that he did not have the capital needed to start a production brewery, and brewpubs were not yet legal in Delaware. Instead, Johnson created the Blue Hen brand, with a logo design based on the Delaware state bird and historic Revolutionary War regiment. The beer company contracted with the Lion Brewery in Wilkes-Barre, Pennsylvania, to brew and package its beer. 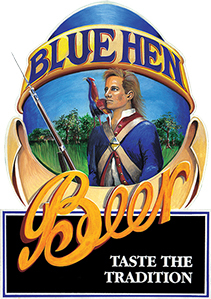 From 1990 until 1998, Blue Hen distributed its award-winning bottled Munich Helles style Lager, Chocolate Porter, and Black and Tan throughout Delaware and into northern Maryland and southeastern Pennsylvania. Though sales were initially good, the downturn that began in 1993 eventually led Johnson to sell Blue Hen to Independence Brewing Company of Philadelphia in 1998. Independence produced the Blue Hen line for two years before going out of business. Perhaps Jeff Johnson will find a brewing partner interested in reviving the Blue Hen Beer label sometime down the road. In the meantime, those with a nostalgic interest in Blue Hen can purchase authorized merchandise from the Blue Hen Beer website.